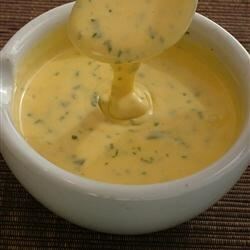 "This is the most flavorful bearnaise sauce you will find. Using fresh tarragon is key." Combine the wine, vinegar, shallots, white pepper, tarragon, chervil, and parsley in a small saucepan. Boil over medium-high heat until the liquid is reduced to about 2 tablespoons. Strain vinegar reduction into a large bowl; set aside. Bring several inches of water to a boil in a saucepan over high heat, then reduce heat to low or medium-low to maintain the water at a bare simmer. Whisk the egg yolks into the vinegar reduction, then place the bowl over the simmering water. Whisk constantly until the yolks have thickened and turned a pale lemon yellow color. The mixture will form ribbons when the whisk is lifted from the bowl. Once the yolk has reached this point, remove the bowl from the simmering water. Slowly pour the hot butter into the egg yolk mixture while continuing to whisk vigorously. Do not stop whisking until all of the butter is fully incorporated or the sauce will separate. Once finished, the mixture will have become a thick and creamy sauce. Serve immediately. Make this easy sauce to complement beef tenderloin or other hearty main courses. I love it this way. A long time ago, I put a version like this into my super blender, it heats as you go...delicious. I love your way too. Good stuff. Wow! So good and I don't have to use my blender. Had to use onion - no shallot - but all else the same. Love it! Really good with an entrecot steak. I didnt have fresh tarragon but I added it dry. I don´t usually rate but this recipe deserves it.